What would you wear to a party in space? Space, in its entire glorious mystifying expanse, has been a timeless muse for fashion designers. During the 1960s, the space race influenced the designs of Paco Rabanne and André Courrèges. More recently, Gucci created a kooky Star Trek-inspired campaign in 2017 while Louis Vuitton showcased a space-themed show for Spring/Summer 2019 during Paris Fashion Week in October. Fashion’s love affair with celestial bodies (and the mythical beings that inhabit those spaces) has resulted in many an iconic design, be it Perspex dresses and headgear, silver puffer jackets or big circular sunglasses. To celebrate the 20th anniversary of the International Space Station (ISS), Lounge asked four Indian designers to undertake space explorations of their own. Envisioning an outfit for a party in space, the designers were inspired by various aspects—from the amorphous anatomy of a nebula to the solar arrays of the ISS—in their signature styles to create designs that are out of this world. Fans of Aggarwal will instantly recognize the designer’s characteristic techniques incorporated in this futuristic dress. “Muted silver, and a variety of its tones, is the prominent palette," he says. “The cut and the textures are angular in a textile woven with polymer strips and the upper bodice emulates the shine of the stars in the Milky Way." For Aggarwal, space has always been an exciting influence, a space speaking of discoveries yet to be made. “Incidentally our flagship store at the Kila (in Delhi) was inspired by the idea of space and a spaceship, the feeling of anti-gravity and the textures closely emulating the inspiration (for the store design)," he adds. “Our everyday worries may seem big but looking at space makes us realize how tiny we really are," says Nidhi Ahuja, co-founder of the label Pankaj & Nidhi. Incidentally, space has been on the Ahujas’ minds lately—Nidhi has been reading National Geographic Society’s Little Kids First Big Book Of Space with their six-year-old daughter and she’s full of trivia. Inspired by the nebula, an interstellar cloud of dust and ionized gases, the duo created a colourful dress. “We wanted to capture the magnificence in a wearable way," says Nidhi. “We envisioned a heavy silk (dress) in midnight blue overlaid with a lot of prints and textures." Couturier Gupta is no stranger to interstellar inspiration. He often references space in his design and has an interest in star-gazing. “I always look for constellations anywhere in the world and try to recognize them," he says. “My menswear collection last year, called Diamond Demons, was totally based on constellations." 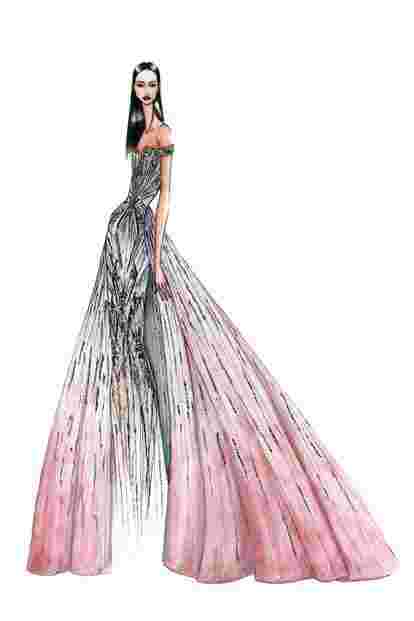 This Pink Prism gown, part of his new couture collection titled Descend, combines architectural tailoring with embellishments that mirror the alignment of stars in a galaxy. The couture collection also includes pieces like an interstellar gown, influenced by stars. “It’s a way of remembering the magic in the universe," he says, and adds, “I guess I have also been missing the stars, with all this pollution in Delhi." Antar-Agni’s impeccably draped and layered garments have multitudes of fans, and Dubey employs similar tailoring in this monochromatic ensemble inspired by the architecture of the International Space Station. A gradient colour palette, going from charcoal to light grey, replicates the metallic structure of the artificial satellite and is accented with coral-red edging for a quirky finish. “The panels represent solar arrays and the layering makes an impact while reflecting the structure of the space station," says Dubey, who also added a hint of India in the garment. 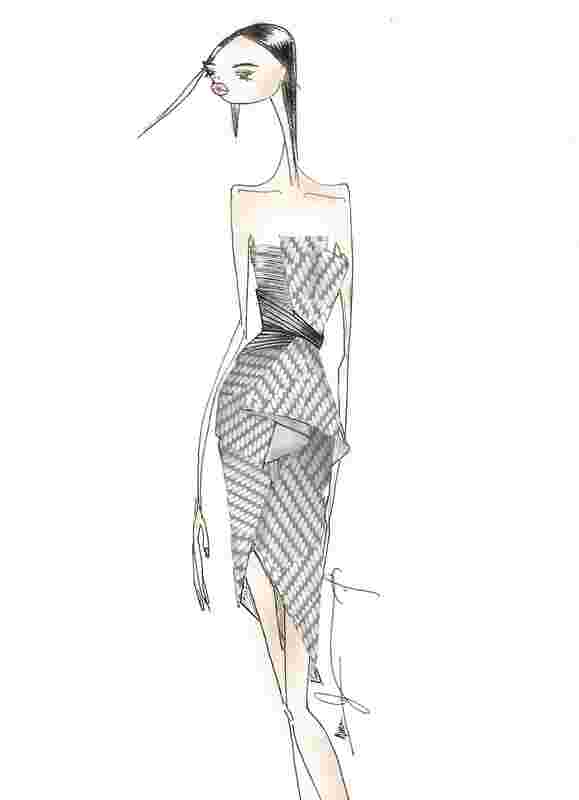 “I wanted to bring our roots in the design and created the metallic stripes from hand-woven zari."